Dreamforce: What is your post-show data strategy? People in the booths next to Donato and I would always scratch their heads and wonder. While they had one or two people at a time in their booth, we would consistently have rows of people 5-6 deep eager to hear and learn more. It was not a fluke, it was not luck, it was a conscious process of interaction that makes people want to stop and engage. Donato even went to other booths and videotaped hundreds of others pitching and engaging. This same process can be driven after the show, but to do it correctly, you need good data. Whew! Was it $25,000, $50,000 or more? You went BIG and invested in a Dreamforce booth. You planned for six months. You booked flights, hotels and maybe hired extra people to cover the booth. Marketing is filling the booth with t-shirts, squeeze balls, pens that don’t work, Tchotchkies and product information sheets. Sales reps are trained on the latest products and they are ready to engage. Meetings with important clients and prospects are set. A pre-show message has been drafted and sent to your entire list. Social media; you’ve made your mark and developed some pre-show buzz. You even got budget for the soft cushion under the carpet. The community knows that you are going to Dreamforce and their feet won’t hurt by standing and talking to you. It’s like cutting your entire year by a month, so you better be ready. What about your Data Strategy? What the heck is a Data Strategy? A Data Strategy is thought process. It is a Data Driven approach to decision making. It is understanding that some data is fairly static and some data is fluid and time sensitive. Your Data Strategy does not supersede Sales and Marketing, it is interwoven in to the fabric of your company processes. A data strategy is any decision that effects the quality, consistency or long term sustainability of your data. You should have Data Strategy for your entire company, however, for the sake of brevity, the focus here will be as it relates to trade shows. Whether you know it or not, data drives your business. Without accurate data, reporting is fiction. Without accurate reporting, analytics fail. Without accurate analysis, decisions are flawed. Hopefully you are convinced. Data is crucial. If you want to come back from Dreamforce with the best data possible, review these 10 tips from a veteran of 200+ trade shows. Technology has the effect of stopping people from thinking. If you are using the scanning devices provided by the show, ask yourself this question: Did YOU input all your information on your registration form? Phone, MOBILE phone, email, LinkedIn, Twitter, etc, etc? Probably not. So get the electronic scan but also get the business card. Never write on the front of the business card. It took many shows and hotel room rants (from me) to convince Dan Hughes, our company co-founder to stop writing on the front of business cards. It makes it really hard to scan the cards and kills the efficiency of getting data into your CRM later. Anyone walking up to Dan at Dreamforce, play a joke on him: When you hand him your card say “now remember not to write on the front of the card”. Develop a note taking shorthand for cards. Shows can change from no activity to a crowd of people all at once. When people are lined up to talk to you, efficiency is required. The same shorthand can be used on electronic scanning devices. The challenge with the devices is that the pre-canned categories, at least in my experience, never fit the actual data that I want to collect. Therefore, I add everything to the notes. Good luck trying to write all the on the front of the card. Again, this WILL also work in the notes section of the electronic badge scanners. Lastly, train your team on these techniques and make sure that everyone is synced on the coding system. Get the company website URL. 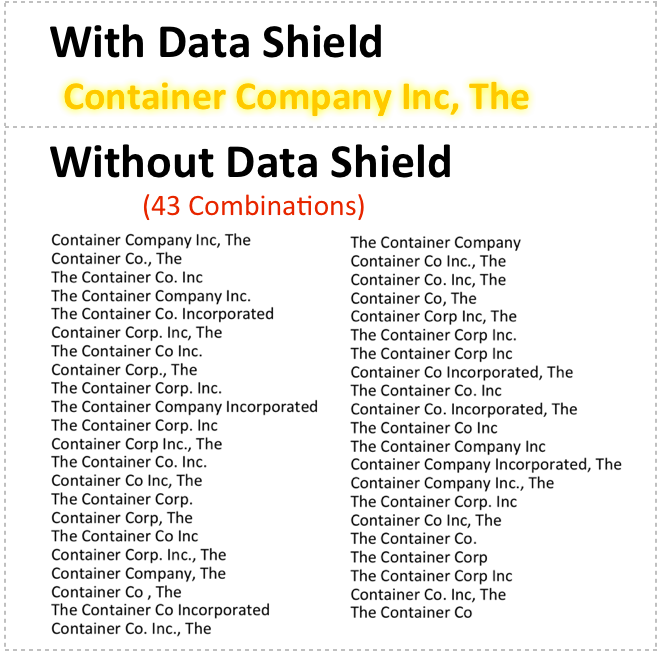 Here is an example of a golden record vs. forty three (43) variants of the same company name. 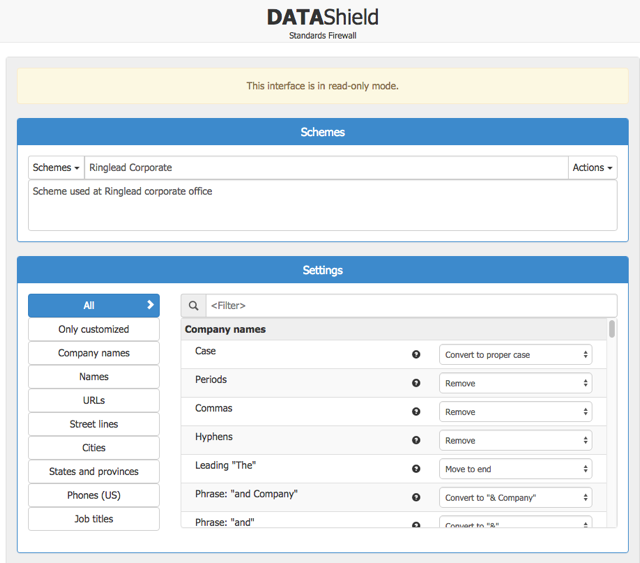 Tools like RingLead’s DataShield will help design a data standard as well as enforce it. Ugly, non-standard data comes in, clean, standardized data comes out. Standardize your trade show data. Below is a sample data standards policy. Every company can define its own policy. This is very powerful when working with data from multiple sources/vendors, including data you collect from a trade show. You can get data from Data.com, Zoominfo, D&B and each company will deliver data in a different format. If you enforce data standards, you will match incoming data records 2 1/2 times more often than having no data standards. This equates to fewer duplicates and lost data in your system. Standardize your existing CRM data. Think about it: if your brand new trade show data is clean, but you are overlaying it on dirty data that has not been cleaned in years, much of the value of your new data will be lost. For those that move data into Marketo, Hubspot, Pardot, Eloqua, etc. The base of data needs to be clean, just like your CRM data. Don’t CREATE duplicates when importing trade show data. Use a tool that automatically resolves duplicates or prompts the user to choose from a list of flagged dupes. RingLead’s Unique Upload tool is head and shoulders above other commercially available data import tools. Immediately take action to standardize, import and enhance your new leads. Contact Data decays at 4-5% per month. If you wait a month to take action on your new leads, you have already lost about 5% of them. Here is another article about how to succeed at trade shows: “Exhibiting at Conferences” by Liz Heiman. Who is Donato Diorio and why should you listen to him regarding data? A veteran of 200+ trade shows, Donato is a thought leader in Technology and Sales, are rare combination that affords insight from two very different perspectives. Donato was a software architect, Recruiter and is the Founder & CEO of Broadlook Technologies, a company that pioneered just-in-time Internet crawling for enhancing sales contact information.